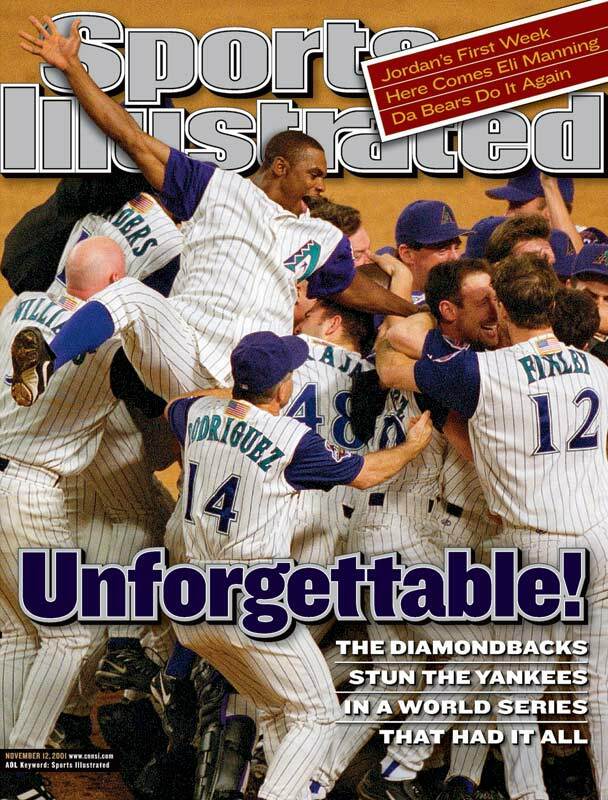 In what is indisputably considered to be one of the most exciting World Series ever played, the Arizona Diamondbacks defeated the New York Yankees nine years ago today to bring our state its first major professional championship. Curt Schilling went pitch-for-pitch with Roger Clemens in a spectacular Game 7, which was topped off by Randy Johnson pitching brilliantly out of the bullpen, and Luis Gonzalez knocking in the series-winning run on a blooper to left-center field. We all have our distinct, personal memories of that great night, and please feel free to share yours in the comments section. Here is Tom Verducci’s great cover story that ran in the Sports Illustrated that featured the cover above. THIS IS AWESOME!!!!!!!! Look at Gonzo burst in tears of joy.